It’s easy to fall into that line of thinking, but it just isn’t accurate. It is, in fact, important to care for your child’s baby teeth, even though they are only occupying a space in the mouth on a temporary basis. There are a number of reasons to make sure your child’s baby teeth are cared for properly, and we will highlight some of those reasons in the content below. Every parent wants to keep their child protected from pain. You can’t protect your kids from everything, of course, so it feels good when you can help them steer clear of something that may have been painful down the line. That is the case when it comes to caring for baby teeth. If you were to neglect the care of your child’s baby teeth, those teeth could wind up in poor condition and may cause pain before they are ready to fall out. Obviously, that is something you would like to avoid for your child, and you can do so just by helping him or her get into good dental habits early on. Just as is the case for adults, caring for children’s teeth does not need to be time consuming or expensive. Build this chore into your daily routine and it will be easy to keep up with as the days go by. As your child moves into the school-age years, there will be plenty of social pressures to deal with along the way. Having a strong sense of self-confidence is important, but it can be tough to see yourself in a positive light when you have issues with your teeth. Despite what some people seem to believe, tooth decay and other oral health issues can happen early in life. If you neglect the health of your child’s teeth, that neglect may show up in their smile before long. It certainly takes more than a great smile to establish high self-esteem in the mind of a child, but this is a good place to start. Learning to speak clearly is one of the big challenges your child faces in his or her early years and having healthy teeth will help to promote clear speech. The teeth play an important role in the way we form the sounds that come together to make letters. Without healthy teeth to use when talking, your child may struggle to develop this key life skill properly. Considering the impact that poor speech can have on the life of a child, it is obviously worth the effort to keep your child’s baby teeth as healthy as possible. It wouldn’t make much sense to allow your child to skip out on dental care while they have baby teeth, only to start enforcing things like brushing twice daily once they get permanent teeth. Kids learn best by getting into routines, so set them up for success by establishing an oral health care pattern early in life. 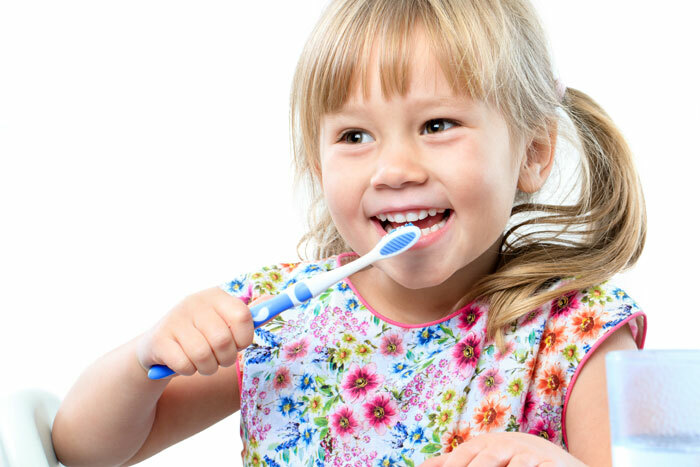 By the time the child is old enough to really think independently about what they do with their time, brushing and other oral health activities will be natural. Just as you would try to establish a good habit of eating vegetables or washing hands, you can lay out a good path by starting early with a focus on tooth care. Yes – your child’s baby teeth are going to fall out at some point. You don’t want that to happen too quickly, however, as losing a tooth prematurely could cause alignment problems when permanent teeth finally are ready to come through. Without all of the baby teeth in place, the remaining teeth could wind up crowding into the spot that was left open. Then, as the permanent teeth start to arrive, they may not make their way down into the right spot for a well-aligned bite and great smile. So, taking the view of baby teeth being temporary and not really important for long-term oral health is simply a mistake. It’s not particularly hard to care for your child’s teeth, and it is most definitely worth it. As a parent, you only want what is best for your child. Don’t make the mistake of ignoring oral health care early in their life, thinking that baby teeth don’t need to be cared for like adult, permanent teeth. Just by taking some simple steps, you can go a long way toward setting your child on the right path for positive oral health. Thank you for visiting Lakeside Dental. We hope you have found this post to be informative – if you have any questions about caring for your child’s baby teeth, please feel free to contact us right away. We take pride in offering excellent dental care to people from all around the Moses Lake area. Give us a call or stop by soon!